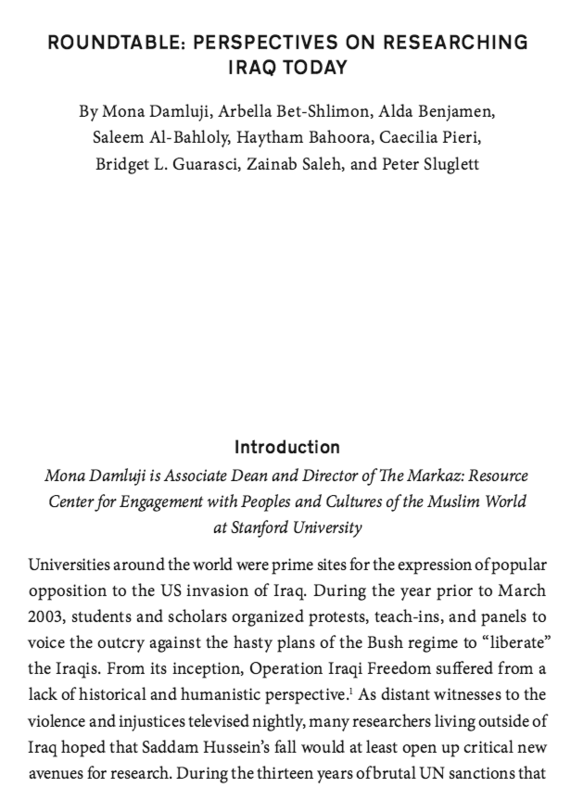 In lieu of an abstract, here is a brief excerpt: Universities around the world were prime sites for the expression of popular opposition to the US invasion of Iraq. During the year prior to March 2003, students and scholars organized protests, teach-ins, and panels to voice the outcry against the hasty plans of the Bush regime to “liberate” the Iraqis. From its inception, Operation Iraqi Freedom suffered from a lack of historical and humanistic perspective.1 As distant witnesses to the violence and injustices televised nightly, many researchers living outside of Iraq hoped that Saddam Hussein’s fall would at least open up critical new avenues for research. During the thirteen years of brutal UN sanctions that preceded the war on Iraq, substantial ethnographic work, cultural studies, and historical research were exceedingly difficult if not impossible due to lack of access to people, places, archives, and information inside the country. Scholarship on Iraq in this period relied chiefly on British colonial archives and top-down political analysis. Damluji, Mona, "Roundtable Perspectives: Researching Iraq Today," Arab Studies Journal in 23, ed. , November 2015, http://www.bridgetguarasci.com/uploads/2/3/5/7/23577274/guarasci_roundtable_perspectives_asjfall2015.pdf, 1, 236-265.